The Frau had another bout of cultural confusion over the weekend. See, she went to a place in Illinois called Chestnut Mountain near Galena. First of all, there was no mountain, there was more like a Baden-sized hill. 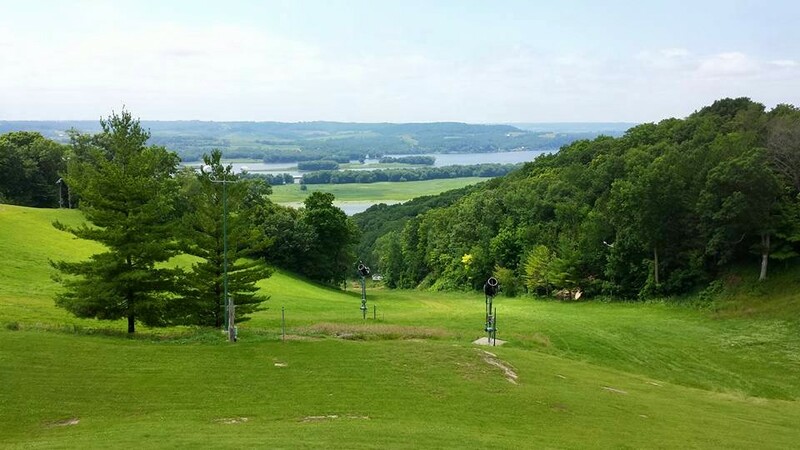 Still, the hills were beautiful and they made her homesick for Switzerland, as did the view of the Mississippi River from the “mountain” lodge. Any other Europeanized American think this view looks like the Rhine? Anyway, The Frau mistakenly assumed that going to a “mountain” and ski resort meant there would be good hiking trails there in the summer. Instead, hiking is not even listed as a summer activity on the Chestnut Mountain website—BUT riding a Segway is. Which makes The Frau wonder: Can Americans get any lazier? While The Frau was eating lunch at the resort overlooking the Mississippi/Rhine, she spotted them: The people on the Segway tours, which one must pay $50 for the privilege to go on. Anyhow, the Segways appeared to be on a trail, which later she saw was marked accordingly. The website says it’s three miles long and it apparently goes over 220 rolling acres of terrain. So The Frau has a question: Would it be breaking some American rule to hike on a Segway trail? She knows that hiking, like walking, is not really an American thing to do. But if she wanted to hike at an American "mountain" resort would that be ok? Obviously there is some danger involved as she could be run over by a Segway tour. But she’d be open to signing a liability form if it would mean that she could do a proper hike in Illinois. Anyway, The Frau will find out next time. When she goes back to this downhill ski resort—with her cross-country skis. Depends on which part of the US, large parts of the Midwest are pretty flat, but go to areas of California and Texas, even new York and Arizona and you'll see a decent amount of hiking. We hike all the time in Hawaii, and we meet more and more people on the trails, too. Admittedly, some of them are European! Westerners are more inclined to hike than Midwesterners. We've got all this scenery! But you could be a trailblazer where you are. Hiking in Hawaii was great. The Frau definitely lives in the wrong part of America at the moment to satisfy her outdoor cravings. you are great. thank's for sharing. Its always great to find good honest practical content. Thank you so much. My first hike back after returning from Switz 10 days ago was in Palos Park. Not a mountain or any view close to that, but at least they had miles (km) of hiking and biking trails (and even horse trails) that people actually used! But a mountain resort without summer hiking trails is not a real mountain resort! wounderful article with amazing information.